I have been using a Staedtler Triplus Fineliner since my school days and it is still one of my favorite fineliners. The Triplus fineliner comes in 30 different colors and features a long thin triangle-shaped barrel with a metal encased tip. The tip is on the softer side but manages to still feel precise and ultra smooth. 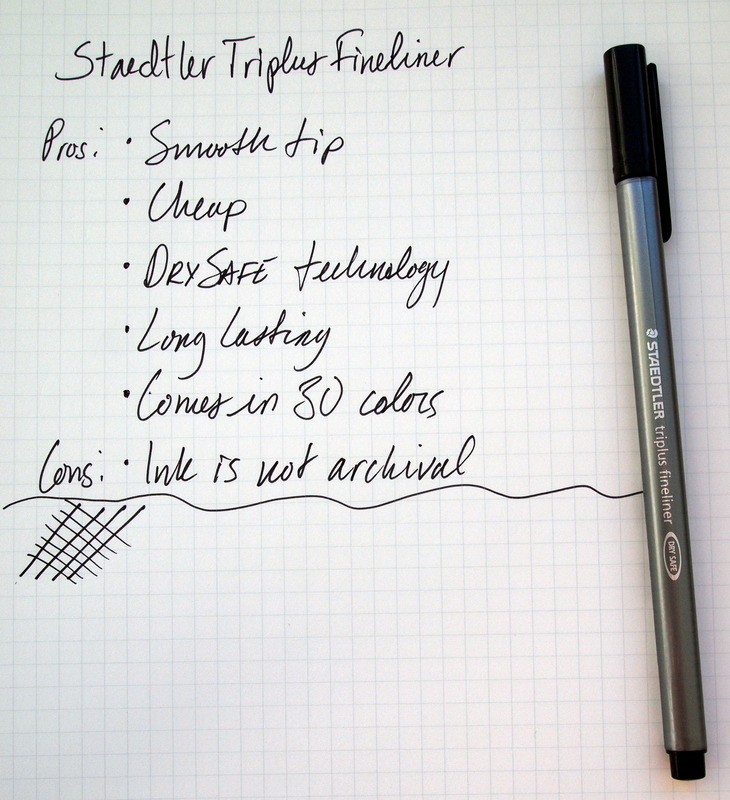 The Triplus fineliner puts down a very clean and crisp line that Staedtler measures at 0.3mm. I enjoy writing with this pen but others may find the line too wide. By changing pressure you can get some line variation. The Triplus fineliner also features “DRY SAFE” technology that allows the pen to be uncapped for days without drying out. I haven’t tested this claim beyond 30 minutes but others have and attest that the Triplus wont dry out after a few days of being uncapped. It is worth noting that the ink is neither archival nor waterproof. For a pen of this type, the Staedtler Triplus fineliner lasts a long time and at $1.30 a piece you can’t go wrong. Also if you buy these pens in a set the box turns into a pen stand which is awesome.